Heating accounts for more than 30 percent of the energy used in the average home. Consider reducing your carbon footprint by replacing or supplementing your current heating system with solar or geothermal heating -- two old technologies that are getting modern upgrades. Their relatively modest up-front costs (and a bit of labor, in some cases) can help you save money on utility bills in the long run. You will also conserve energy and reduce your ecological impact. The cost of solar electric panels remains prohibitive for many homeowners, and it may not be feasible to install enough solar electric panels to cover your heating needs. 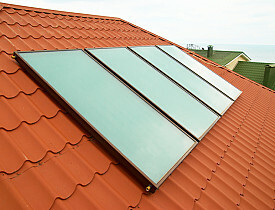 A cheaper and simpler solution is a solar hot-air collector, which can be mounted on a roof or wall, or even in the backyard. The device consists of a tempered glass panel, insulation panels and a metal collector plate layered inside an aluminum frame. An electric fan circulates air from the house through the collector and back into the home. On sunny winter days in cold climates, the metal plate heats up the air and increases the indoor temperature, offsetting some of the furnace's energy use. A 2007 case study in Home Power magazine estimated that a homeowner could recoup an initial investment of $4,000 within eight years through lower natural gas bills. After eight years, he would be pocketing an estimated $500 in additional savings per year. If you'd prefer to spend far less than $4,000, Mother Earth News magazine offers detailed plans for a DIY solar hot-air collector that you can build in about an hour for around $40. Geothermal, or geoexchange, heat pumps (GHPs) are a more expensive prospect and are certainly not a DIY project. GHPs, which require you to hire an HVAC pro for expert installation, take advantage of the constant temperature six feet under your home. Because the subsurface temperature is relatively warm in winter and cool in summer, a GHP can replace both your heating and air conditioning systems. Residential geothermal heat systems have been used since the 1940s, so they are certainly not a new idea. However, the systems are getting less expensive, more reliable and more technologically advanced. The best GHPs run water, rather than air, through the system, and can even supply hot water for the house. The newer models have two-speed compressors and variable fans for additional comfort and energy savings. Look at Energy Star ratings for GHPs to help you choose a reliable, energy-efficient system. There are also state tax credits and incentives for GHPs. The Department of Energy estimates a GHP for the average-size home would cost about $7,500, but suggests that the initial cost can be recovered in under 10 years by reducing or eliminating heating, cooling and hot water bills. Geothermal and solar heat systems are not new ideas, but they are becoming more advanced. Tax incentives and the prospect of reducing rising utility bills make these efficient options even more attractive.